Between 1984 and 1989, a new D. I. Y. scene sprung up on both sides of the Berlin Wall. This new scene was inspired by both punk and post punk, and saw the participants in East and West Germany distribute their music on cassette. It was the ideal medium for the various filmmakers, musicians, painters, performers and poets that were part of the new D. I. Y. Cassettes were cheap, and it was quick and easy to duplicate further copies to satisfy the rising demand. In West Germany, there was an air of excitement at being part of a new and developing scene. There was a sense that anything was possible, as the participants created and distributed music on their own terms. They didn’t want to be part of the record company machine. However, the participants were determined that they would fulfil their potential. Abraham Maslow would’ve been proud of the participants in the developing scene’s determination to self-actualise. It was a similar case on the other side of the Berlin Wall. There was also a burgeoning D. I. Y. scene in East Germany, albeit one that was much more underground. Unlike in West Germany it was illegal to duplicate cassettes. Anyone wanting to duplicate cassettes had to seek permission, and the duplication had to be sanctioned by the state authorities before it could go ahead. If the state authority didn’t approve of what the applicant was wanting duplicated, no sanction was given, and in some cases the applicant was punished. Especially if they had criticised the state in some way. There was no such thing as free speech behind the Iron Curtain, which would stay closed until 1989. Given how difficult it was to get tapes duplicated for the burgeoning East German D. I. Y. scene, it was no surprise that participants set about trying to subvert the system. Some were so disillusioned with life that they made plans to escape to the West. They knew in doing so, that they were risking their life. However, if they stayed in the East, they knew that they would never fulfil their potential and self-actualise. However, escaping to the West was extremely risky, and many had lost their life when trigger happy guards shot those making their escape from the East, in search of a better life. Those who were unwilling to risk their life, stayed behind and tried to create a scene from within. That scene had ideological motives, which risked upsetting the authorities. This was a risk that musicians, painters, performers and poets were will to take. They were unwilling to be silenced, and the nascent music scene offered a conduit for their message. For others within the scene, their music was non-political. Instead, they were creative and had a way with words and were drawn to music. They quickly became part of the scene, which included musicians with a political agenda and those who hadn’t. The latter turned their attention to a variety of disparate subjects. Others came to the scene looking for an outlet for their creativity, while some saw the scene as a way of escaping the reality and poverty of day-to-life in East Germany. Life was very different in East Germany, than it was on the other side of the Berlin Wall. To those in the East, the Berlin Wall was the land of plenty and a nirvana that they dreamt of. While they dreamt of one day, enjoying the same freedom, those within the D. I. Y. scene in the East took refuge in their music. As the scene developed, it became apparent that there were many talented musicians within D. I. Y. scene. They seamlessly flitted between and fused different musical genres. Often, the result was ambitious and inventive music. This music found its way onto illicit cassettes, which at first, were only heard by those within the D. I. Y. scene. Then things started to change. This began with the partial opening of state controlled media and cultural sites, which was part of a wider change of conditions within East Germany. Suddenly, it looked as of there was a wind of change blowing through the East. That proved to be the case, when the state-run radio station started to play some of the previously illegal cassettes. For those within the D. I. Y. in the East, this was progress. Not long after this, some of the participants within the D. I. Y. scene took to the stage at the Palast der Republik, which was a prestigious venue. No longer was this underground scene, as newcomers watched and embraced the music. At first, they struggled to understand the myriad of what they called “weird noises” that emerged from the stage. Gradually, though, it started to make sense, and by then, some of the bands that had been part of the D. I. Y. scene well-known names. They had signed to the state-owned record label AMIGA. Some saw this as progress, while others saw it as selling out and kowtowing the state machine. However, soon, this would all be irrelevant. On the ‘9th’ of November 1989, a few sections of the Berlin Wall were opened, and thousands of East Germans crossed freely into West Berlin and West Germany for the first time in nearly thirty years. This was the beginning of the end for East Germany. East Germany held what proved to be its last elections in March 1990. The East German branch of the Christian Democratic Union of Germany were declared the victors, which accelerated the reunification process. It took place on the ‘3rd’ of October 1990, when the five East German states officially joined the Federal Republic of Germany. After forty-one years apart, East and West Berlin united as a third city-state, while East and West Germany formed the new Germany. This was a landmark for Germany and all Germans. This included all those who had participated in the D. I. Y. scenes in East and West Germany. Many within the two scenes who had managed to communicate over the last few years met for the first time. Some of those who had been part of D. I. Y. scene in East Germany were left to reinvent themselves, and found their career at a crossroads. While some became part of the newly unified Germany’s music scene, others turned their back on music. Their legacy was the cassettes that they had recorded. Fourteen tracks from these cassettes feature on Magnetband Experimenteller Elektronik-Underground DDR 1984-1989, which was recently released by Hamburg based Bureau B. 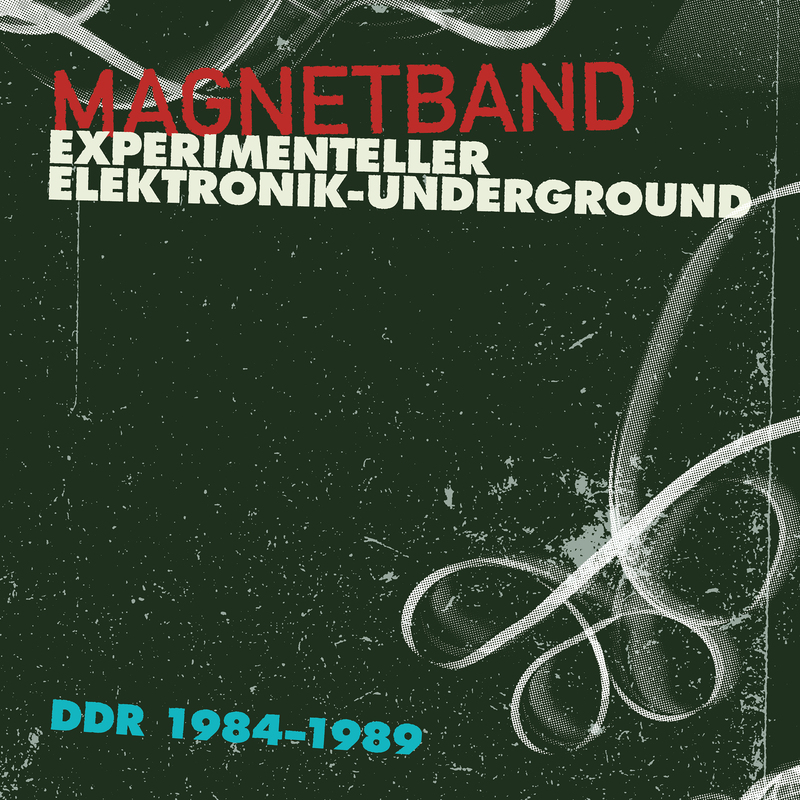 The fourteen tracks on Magnetband Experimenteller Elektronik-Underground DDR, 1984-1989 feature contributions from A. F. Moebius, Kriminelle Tanzkapelle, Heinz and Franz, Magdalene Keibel Combo, Choo Choo Flame, Stoffwechsel, Corp Cruid, Taymur Streng/Ornament and Verbrechen, Der Demokratische Konsum, Gesichter, Ihr Arschlöcher, Aponeuron and Robert Linke. They’re a reminder of what was a vibrant musical scene that sprung up in East and West Germany, before the two countries were reunited after forty-one years. Just one name features twice on Magnetband Experimenteller Elektronik-Underground DDR 1984-1989..A. F. Moebius, which is the alias East German musicians Frank Bretschneider dawned for his early solo recordings. His two contributions come from a cassette album he recorded with Heinz and Franz. The album was recorded between 1986 and 1997, and eventually, Heinz and Franz/A. 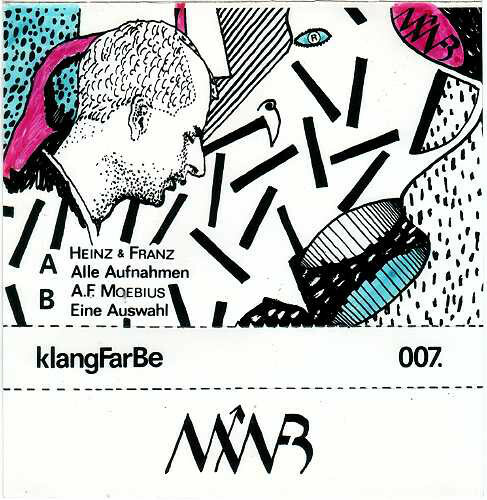 F. Moebius released Alle Aufnahmen/Eine Auswahl on Frank Bretschneider’s KlangFarBe label in 1988. A. F. Moebius’ two contributions are Erika which was recorded in 1986, and Böser Traum in 1987. Both tracks are best described as experimental electronica, with Erika heading in the direction of avant-garde. These two tracks more than hint at what was to come from Frank Bretschneider, who nowadays, is one of the leading lights of the German electronic music scene and runs the Raster-Noton label. One of the tracks Heinz and Franz contributed to Alle Aufnahmen/Eine Auswahl in 1988, was Immer. It’s a moody and dramatic electronic track with an electric guitar adding to the cinematic sound. Nearly thirty years later, Immer is a timeless track that is a tantalising taste of the delights to be found on Alle Aufnahmen/Eine Auswahl. Another of Frank Bretschneider’s projects, was Kriminelle Tanzkapelle which was in existence between 1985 and 1986. 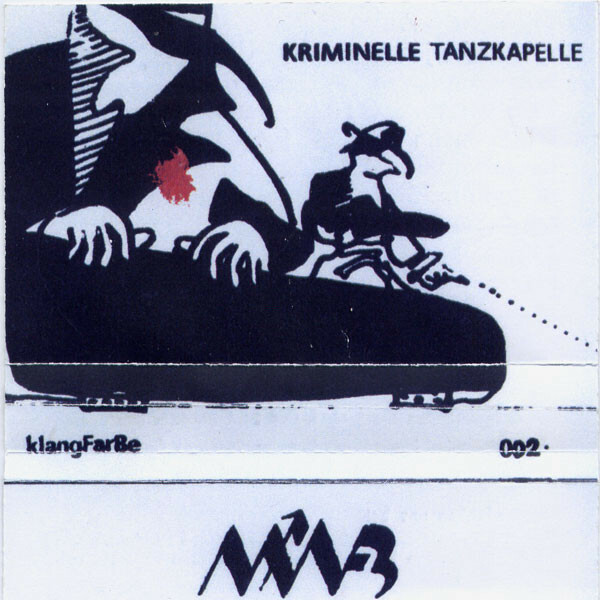 Kriminelle Tanzkapelle recorded their debut album on the ‘5th’ of April 1985, and released their Glückliche Jahre album on Frank Bretschneider’s KlangFarBe label in 1985. One of the tracks on Glückliche Jahre was Klatschmohn, an urgent electronic track where synths and dialogue combine to create another ambitious avant-experimental track. When Christian Lorenz and Paul Landers decided to form a band together, they decided to name the band after two streets in East Berlin, Magdalene Keibel Combo. That might seem innocuous at first glance. However, anyone whose familiar with the history and geography of East Berlin will know that Magdalenenstraße was the former headquarter of the Stasi, and Keibelstraße was the central police station. Having dawned what was a somewhat risky name, and guaranteed to bring unwanted attention to them, the pair began recording their debut album Das Gemeine Reitbein. It was recorded in a flat in East Berlin, and given away free with issue six of Verwendung magazine in 1989. One of the tracks on the album was Er Hat’s Geschafft, which showcases Magdalene Keibel Combo’s unique and unmistakable brand of fun-packed punk rock. When Bo Kondren recorded Nein, he was known within the D. I. Y. scene as Choo Choo Flame. One of the tracks he recorded and mixed on a two-track recorder was Nein. It lay unreleased until 2015, when it made its debut on Spannung. Leistung. Widerstand. Magnetbanduntergrund DDR 1979-1990. Two years later, the atmospheric and haunting sound of Nein make a welcome return on Magnetband-Experimenteller Elektronik-Underground DDR, 1984-1989. Stoffwechsel recorded Fly, Fliege, Fly in November 1989, and two years later, it made its debut on the cassette Trotsch: Le Petit Ortkos, which was released by Peking Records in 1991. However, the album wasn’t successful and the next time the track was heard was on Spannung. Leistung. Widerstand. Magnetbanduntergrund DDR 1979-1990. Fly, Fliege, Fly is best described as broody, cinematic fusion of electronica, downtempo and Nu Jazz which was way ahead of the musical curve. It’s a welcome addition to Magnetband-Experimenteller Elektronik-Underground DDR 1984-1989. 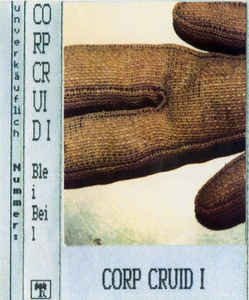 In 1989 Corp Cruid released their eponymous debut album on a C60 cassette. Corp Cruid was released on the Blei:Bei label, featured 37 °C. Essentially, 37 °C is a fusion of electronica and experimental music and dialogue. However, the keyboards sometimes head in the direction of progressive rock. They add a darkness to this ambitious, genre-melting track. The collaboration between Taymur Streng/Ornament and Verbrechen in 1982 resulted in Das Sentimentale Ufo. It’s a futuristic sounding example of experimental lo-fi electronica. Although it lasts just over a minute, it’s music that leaves a lasting impression. Der Demokratische Konsum Die Kuh was recorded in 1984, and is a fusion of electronica and punk. The vocal is akin to Primal Scream Therapy, as it’s delivered with power and passion. After the recording the song lay released until 1984, when its debut on Spannung. Leistung. Widerstand. Magnetbanduntergrund DDR 1979-1990. Two years later, it returns for an encore on Magnetband-Experimenteller Elektronik-Underground DDR 1984-1989. SK 8 Gesichter’s Böser Traum was recorded in the Black Room, at a flat in Metzer Street in East Berlin in 1989. For twenty-six years the track lay unreleased, until it made its debut on Spannung. Leistung. Widerstand. Magnetbanduntergrund DDR 1979-1990. Two years later, this ambitious genre-melting track also takes a bow on Magnetband-Experimenteller Elektronik-Underground DDR 1984-1989. Another track that made its debut on Spannung, Leistung, Widerstand, Magnetbanduntergrund DDR 1979-1990 is Ihr Arschlöcher’s Urtramp which was recorded in April 1988. It’s a fusion of avant-garde and industrial music, that later, become futuristic and lysergic. Sometimes, Urtramp sounds as if it’s been inspired by Faust and some of the of the pioneers of the Berlin School. The result is a truly captivating track from a group who if they had been on the other side of the Wall, would’ve flourished and enjoyed a lengthy career. Aponeuron’s Jab Gab Hej made its debut on issue six of Verwendung magazine in 1989. The track was recorded for Acid House party, and is sure to remind many people of what was in 1989 and a new and exciting musical movement. Twenty-six years later, and Jab Gab Hej featured on Spannung. Leistung. Widerstand. Magnetbanduntergrund DDR 1979-1990. Two years later, and Jab Gab Hej is a welcome addition to Magnetband-Experimenteller Elektronik-Underground DDR 1984-1989. For anyone who has even a passing interest in Eastern European music, then Magnetband-Experimenteller Elektronik-Underground DDR 1984-1989, which was recently released by Bureau B is a must-have release. 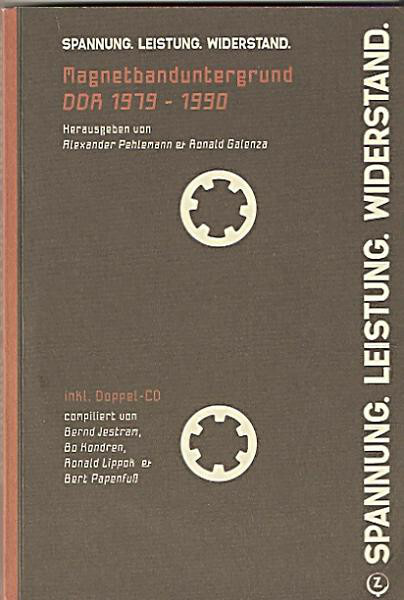 It documents the five year period before the reunification of Germany. During this period, artists, musicians, performers and poets became part of the burgeoning D. I. Y. scene. Using whatever instruments and technology they could lay their hands on, they recorded the fourteen tracks on Magnetband-Experimenteller Elektronik-Underground DDR 1984-1989. Some of these tracks were released between 1984 and 1989, while others weren’t released until much later. Although these tracks were all recorded during the same period, they’re all quite different. These artists weren’t dedicated followers of fashion, who slavishly latched on to the latest musical genre. Instead, they combined elements of disparate genres to create new, ambitious and inventive music. To do this, they combined elements of Acid House, ambient, avant-garde, Berlin School, drone, electronica, experimental and industrial, which join jazz, Krautrock, psychedelia, progressive rock and punk on Magnetband-Experimenteller Elektronik-Underground DDR 1984-1989. The result was ambitious, inventive and captivating music. Some of the tracks on Magnetband-Experimenteller Elektronik-Underground DDR 1984-1989 may be over thirty years old, but they have stood the test of time. In some cases, it’s hard to believe that these songs were recorded so long ago, using equipment which compared to that available today, seems quite basic. Using that equipment, these musicians were able to use that equipment to create ambitious music that pushed musical boundaries to their limits and sometimes, way beyond. Some of that music on Magnetband-Experimenteller Elektronik-Underground DDR 1984-1989 is also timeless, while other tracks are inventive, thought-provoking and cinematic as some of the leading lights of East German D. I. Y. scene showcase their considerable skills. ← THE LIFE AND MUSIC OF JUNIE-FROM OHIO PLAYER TO SOLO ARTIST, FUNKADELIC AND BEYOND.